For $145, you get a 3D2N Deluxe Twin Pool View Room Stay (worth $222). For $209, you get a 4D3N Deluxe Twin Pool View Room Stay (worth $326). For $269, you get a 5D4N Deluxe Twin Pool View Room Stay (worth $429). Pavillon Indochine Hotel is the closest to UNESCO Heritage Site, Angkor Wat. This tropical resort offers an oasis with spacious rooms fitted with wooden flooring. Antique furniture, sculptures and ancient posters also add an old-world charm to the otherwise modern hotel. In rooms, enjoy modern amenities like private bathrooms, cable channels on a flat screen tv, free wi-fi access and more. Beds are also warm and cosy and covered with a mosquito net to prevent biting insects disturbing from peaceful sleep. Hungry guests can fill up at the Mekong Restaurant. Dine al fresco and pick from a selection of the best Asian and Cambodian cuisines. During breakfast, pick up a cup of freshly brewed black, jasmine, green or oolong tea. And have eggs done your favourite way with a chef that will cook up fried, scrambled or omelettes for you. If in need of physical rest and relaxation, head to the spa, and enjoy a soothing massage. Choose simple but refreshing back and shoulder, mind renewing aromatherapy or a traditional Khmer massage that has health benefits dating back from centuries ago. 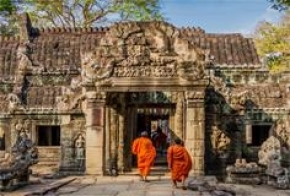 Deeply charming Siem Reap provides a part rural, part urban escape for cityslicking folk. 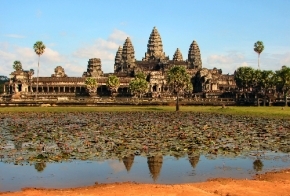 Start trips out with a must visit to Angkor Wat, just minutes away from the hotel. Choose to walk around and marvel at the intricately designed temples that have been standing since the 12th century. Or rent a bike and cover more ground. Ride along the main temple circuit and you'll have plenty of time to see the big three temples. Continue on the trail of old by visiting the Old Market. Alleys and streets are covered in a grand selection of souvenirs, brand knock-offs and locally handmade pottery. Don't mistake the word, 'souvenirs' to mean tacky. You'll find handwoven scarves, hammocks and handcrafted silver jewellery. After a day of walking around, visit Pub Street to chill out and grab a drink. So named for the number of bars here, finding one that fits your type of crowd, music and cocktail choice is easy. Food here is also a must try in this area. Once colonised by the French, local cuisine is still heavily influenced by the multitude of flavours of France. Or for the more daring, partake in the Cambodians' high-protein diet of insects. The least intimidating, Red Tree Ants with Beef and Holy Basil is a good introductory course on eating bugs. But level up with eating crispy fried tarantulas from the Old Market for a life-changing experience. Reviews Fantstic little hotel just outside the centre of Siem Reap. The staff were brilliant, the food fantastic, the place well kept and the atmosphere 15 out of 10! The rooms could be freshened up just a little as could the place in general but an amazing little haven in a wonderful country full of wonderful people!!!" The staff were fantastic and did everything they could to make our stay perfect. The pool is a beautiful spot and ideal for relaxing after a day in the heat walking around temples. The hotel organised bikes for us which were dropped off and picked up at the hotel. It was so simple to cycle to the temples from this hotel. Our tuk-tuk driver for 2 other days was wonderful, friendly and super-helpful. I would recommend this place highly and can't wait to go back!"